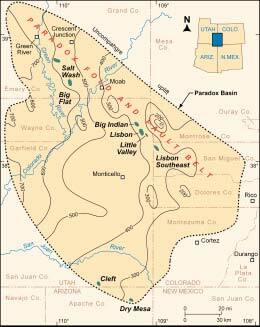 Paradox Basin of Utah and Colorado showing the location of oil fields productive from the Mississippian Leadville Limestone; the thickness of the Leadville is also shown (contour interval = 100 feet). The U.S. Department of Energy (DOE) has selected to fund a Utah Geological Survey (UGS) project titled, “The Mississippian Leadville Limestone Exploration Play, Utah and Colorado – Exploration Techniques and Studies for Independents” as part of its Advanced and Key Oilfield Technologies for Independents (Area 2 – Exploration) program. The purpose of this program is to “expand the knowledge base through which industry can bring additional oil reserves and new technology options into the marketplace in a cost-effective and environmentally acceptable manner.” This effort is designed to push the limits of standard exploration technologies and improve them. The total cost of this new, three-year UGS project, one of three selected out of 28 proposals, will be about $536,000 with 50 percent cost share from DOE. The 350-million-year-old (Mississippian) Leadville Limestone has produced over 53 million barrels of oil from six fields in the northern Paradox Basin region of Utah and Colorado. All of these fields are currently operated by small, independent producers, and only independent companies explore for Leadville oil targets in the region, 85 percent of which is under the stewardship of the Federal Government. This environmentally sensitive, 7,500- square-mile area is relatively unexplored with only about 100 exploratory wells that penetrated the Leadville (less than one well per township), and thus the potential for new discoveries remains great. The Leadville Limestone was deposited in a warm, shallow sea. Oil accumulated in reef-like buildups of limestone that developed on older fault-related topographic high areas. Oil is produced from traps in the Leadville formed by both folds (anticlines) and faults. The overall objectives of this study are to: (1) develop and demonstrate techniques and exploration methods never tried on the Leadville Limestone, (2) provide maps that can be used to target areas for exploration that show the ancient environments of the Leadville, possible oil migration paths based on well pressures, and types of oil, (3) increase oil production from new and old fields by describing in detail the characteristics of the Leadville Limestone from Lisbon field (the largest producer of Leadville oil), (4) reduce exploration costs and drilling risk especially in environmentally sensitive areas, and (5) add new oil discoveries and reserves. The project will be conducted in three phases, each with specific objectives. The objectives of Phase 1 will involve a case study of the Leadville Limestone at Lisbon field to understand the rock characteristics so they can be applied regionally. Phase 2 will consist of a low-cost, environmentally sensitive field demonstration of new exploration technologies such as surface geochemical surveys of the soil, using a variety of new techniques, to detect where oil or gas may have leaked to the surface from Leadville accumulations at depth. The objectives of Phase 3 will be to: (1) determine regional depositional environments for the Leadville by evaluating rock cores from wells, Leadville surface outcrops, and modern analogs such as the Bahamas or Florida Bay, (2) identify potential oil-prone areas based on shows (using low-cost microscopic fluorescence of oil in rock samples from wells), and (3) target areas for Leadville exploration. These objectives are designed to assist the independent producers and explorers who have limited financial and personnel resources. All project maps, studies, and results will be publicly available in digital or hardcopy format and presented to the petroleum industry and other interrested scientists.